Why do we value children so little? This question was posed by Ingrid Wolfe, consultant in children’s public health medicine and director of the Evelina London Child Health Partnership, speaking at the launch of the sixth edition of Child Poverty Action Group’s (CPAG’s) Poverty: the facts on 24 April. Given it was the launch of a book called Poverty: the facts, surprisingly little was said about the facts. This wasn’t because there aren’t facts to give but because this is stuff we already know. We have to be on two tracks simultaneously when addressing child poverty. While continuing to think about how we can achieve a good society for all our citizens in the long term, we also need to focus on immediate solutions that we know do work – notably increasing the incomes of poor people. Why do we allow this in such a rich country? – another question posed by Wolfe. This is one I can’t begin to answer. In Scandinavian countries disadvantaged children are favoured, and tax and benefits more or less eliminate child poverty. Here we have extremely high levels of inequality, and we reinforce proportional disadvantage. 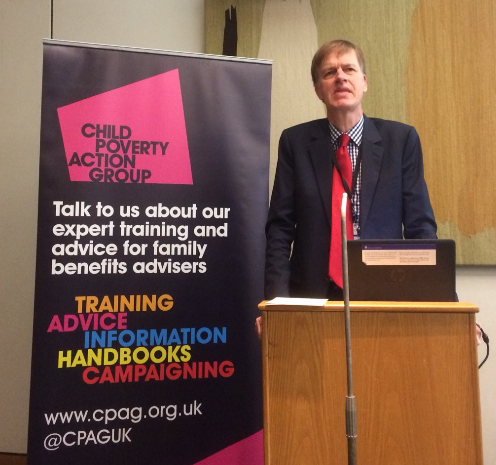 Stephen Timms MP, hosting the launch at Portcullis House, Westminster, framed the meeting with a shocking prediction: by 2022 we are due to have 5 million children below the poverty line – an increase of 1 million, mainly because of the roll-out of Universal Credit. The latest figures, published on 22 March, show that 500,000 more children are now in relative poverty than in 2010, up from 3.6 million to 4.1 million, said Alison Garnham, CPAG chief executive. We have record levels of employment but rising child poverty, largely owing to the poor quality of work. Two thirds of children in poverty have working parents. Entitlement under Universal Credit will be less for most people, with the average family losing between £1,000 and £2,500 per year over the next five years. Families with four or more children lose more. The poverty gap is also growing. This means that family incomes are falling further below the poverty line, so families that are already poor are falling more deeply into poverty. Families are now on average £50 per week worse off than in 2010, he continued, but the focus is on providing work, not money. ‘Giving money is seen as causing dependency,’ he said. Yet it has been proved to work. Child benefits increased significantly in 1999 and had a dramatic impact on hardship in two years. Parents didn’t squander extra money, as some predicted, but spent it on children’s shoes, better diet, perhaps even a modest holiday. Indicators of hardship halved among those receiving benefits. Between 1998 and 2008, said Garnham, the UK had the biggest falls in child poverty in the OECD. What we need now is better pay, she said, more stable jobs, an end to the benefits freeze, and restoration of the link between benefits and need (ie no benefit cap, no two-child policy). Low income is the only causal factor that connects with outcomes for children, she pointed out. Wolfe also mentioned the need to restore the target to reduce child poverty to focus attention on the issue, and to integrate education, health, fiscal and social protection policy (‘we train people to work in silos; we now need to break these down’). She recommended ‘a triple lock on child poverty, as we have on pensions’. How can we reach into people’s hearts and minds? We don’t need to enter a discussion about the evidence, we need to translate it into public policy, on this all were agreed. ‘We have won this argument before,’ Marsh pointed out. ‘Blair promised to reduce child poverty and people supported him.’ But now we have lost it again. 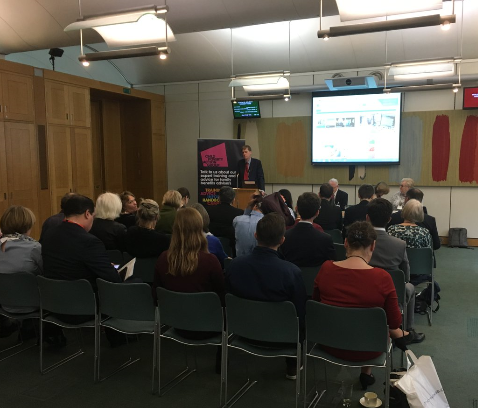 Are there lessons to be learned from mental health charities working to bring mental health into public consciousness? A lot of academic work has been done on reducing the stigma of mental health, but not on reducing the stigma of poverty, Garnham said. She mentioned Joseph Rowntree Foundation’s Talking About Poverty project. But how far will this take us? While it gives useful pointers about how to avoid the worst effects of damaging and labelling language, it doesn’t give us the vocabulary to build the conditions under which people will really care about the wellbeing of other people’s children. Alongside immediate steps to increase the incomes of poor people, we need a complete rethink of what sort of society we want and how we want it to be organized. This is a project for the long term.